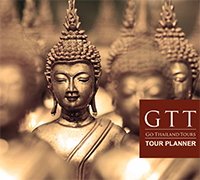 Who we are: A team of real experts and travelers with a passion for Thailand for over 25 years in the tourism business, Go Thailand Tours Co.,Ltd., has representatives in all major destinations in the country and represent some of the most esteemed travel agencies in Europe and other parts of the world. What we can offer: An extensive list of tour programs and hotels all over Thailand; An experienced team to assist and accommodate your travel needs the best we can; A one-stop-service for easy travel arrangements. Trusted partner agencies in Southeast Asian countries; and The best holiday experience of a lifetime.